Who would have ever thought Mick Jagger and the Rolling Stones would have come up with the perfect song, 'Rock and a Hard Place', on their 'Steel Wheels' album in 1989 to describe our current budget and economic situation in America in 2010? You ought to go ahead and click on the link above and open it alongside as you read this...at least you will hear some good music to help assuage the sobering facts as they are today that we simply have to face up to and fix. Here's the 'Rock': We can't keeping running up this insane debt forever. It will catch up to us sooner or later..probably sooner than we think. Just take a look at Greece, Ireland, Spain, the EU. Here's the 'Hard Place': We have already done all the 'easy' things politically to make people happy in this country. 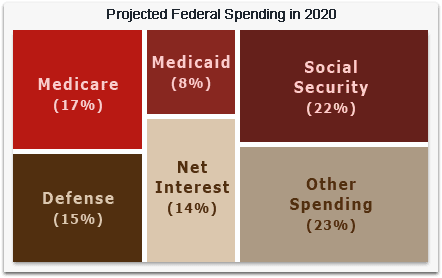 Massive tax cuts; massive spending programs...all of which has led to the 'hard place' or day of reckoning when these accounts have to be balanced.... or at least moderated considerably from current baseline projections. And that means massive tax increases or massive spending reductions...or both at the same time. Extending all of the Bush tax cuts after the end of calendar year is just not going to happen. It is not in the cards. President Obama and the Democrat-controlled Congress have been very clear about their intention to allow those tax cuts aimed at people with income, whatever the source, over $250,000 in a single year to completely expire, never to be seen again. But given the budget pressures we now face, just how far down the income ladder below $250,000 will President Obama and Congress go in order to prevent these budget deficits from completely getting out of control? In fact, a budget-wonky argument that holds water can be made that none of the Bush Tax Cuts should be extended because these budget deficits are simply so enormous right now. It will depend on how the markets and bond purchasers view the ‘seriousness’ of the United States to get its economic house in order. Before we become another Greece. Or Ireland. Or any of the other basket-cases in the EU today. 3) There is not a very high degree of probability that we will ever see massive increases in capital gains tax revenue as what occurred during the "Internet Boom Days'...by some accounts, close to $100 billion/year of 'unanticipated' revenue realizations over CBO projections from 1997-2000. So where is the economic stimulus going to come from today? If we have to allow all of these Bush Tax Cuts to expire at the end of the year, they will pretty much put a damper on getting out of this Recession that is not being solved by all of the billions in stimulus money that has been spent so far, won't it? The one single monumental issue that no one has had the courage to tackle is the clear and incontrovertible evidence that we are running out of resources to pay for our exploding entitlements programs. There is a huge surge of now-retiring Boomers about to drain both the Social Security and Medicare reservoirs. The continued insistence of Congress and the White House to keep passing new entitlements, Medicare Part D in 2003; health care in 2010, without paying for them with higher taxes and/or offsetting spending cuts, has not helped the budget situation one little bit at all. And the one reliable thing that has been quietly increasing tax revenues to the federal government for the past 26 years since 1984, in sort of a sneaky, stealth bomber sorta way, the so-called ‘Social Security Surplus’, has peaked and is going to go down as well right now! In just 7 years, in 2017, there will be not be any SS cash ‘surplus’ any more. In fact, due to the recession, SS is technically in bankrupt status today….expenses going out exceed SS payroll taxes coming in! Today! Right this very minute! Without the cushion of the so-called Social Security surplus over the past 20 years at least, revenues to the federal government would have averaged closer to 16.8% of GDP, not the 18.5%-to-19% of GDP you hear many commentators use as 'justification' to cut taxes further. But this is one of those times in our nation's history when great leaders have to step up and lead and great compromises are called for and have to happen, for the long-term benefit of our nation. President Obama, if he is to become the leader we all hope he will be one day, should tell all the Americans that he has decided, as our Chief Executive Officer, that all of these Bush Tax Cuts will expire as of midnight, December 31, 2010 because the government needs all of that increased revenue to pay for all the government services we already had and to which he has added mightily during his very short term in office. You might not like it, but he said he wants more government 'to change things' and if he is going to be true to his word, then he should propose all of the taxes necessary to pay for it all as well. We think the fact that President Obama will be in office for the next 30 months for sure sets the stage for a potential 'Massive Compromise' on the order of 'The Great Compromise', 'The Missouri Compromise of 1820', 'The Compromise of 1850' or any other bi-partisan deal leaders have hammered out for Americans in the past. 'The Massive Compromise Act of 2011' is just waiting to be passed and it would make the extremely successful 1997 Budget Act look like a piker by comparison. Little discussion is given to the now $2 trillion plus federal reserve balance sheet. While these assets were put on their books as a boost to the economy, such as buying $1.5 trillion in mortgages, thus putting $1.5 trillion into the economy paid to bond holders, developers, Realtors, closing attorneys, appraisers, etc., and then reused to pay grocers, department stores, buy cars, etc., we are now faced with the "drag" of those assets being paid down. As an example, an owner of a federal reserve mortgage earns a living, and makes a $2,000 per month mortgage payment. Of that, say $400 goes to taxes. The remaining $1,600 goes to pay principal and interest, both of which go to the federal reserve. The "drag" on the economy is that while the employer pays out $2,000 in salary to the employee to be used for housing, instead of being "multiplied" in the economy by 2:1, 3:1, or 4:1 by going to the bank, re-lent, spent at a grocery store or used at department store by others, etc., that $1,600 goes into the abyss. Not seen again. Evaporates as the federal reserve sheet declines in balances. This is where reducing the federal reserve balance sheet of mortgages will slow the economy by perhaps 1% of GDP (from where it would otherwise be) while we are paying it down. You can also see why the Fed is reluctant to sell these mortgages outright back into the market. It would be an even bigger abyss of economic activity lost. Fortunes delayed; jobs not created. Hmmmm...it does sound like a rock and a hard place for the Fed as well. this is worthy of a full posting in and of itself...very, very helpful insight everyone needs to know.